3-D scanning of three statues: Davies, Caldwell, Whitman. December 2015. In the late 1890s, six statues representing famous early American Presbyterians were designed by Alexander Stirling Calder, fabricated in North Philadelphia, and transported by horse and buggy to the heart of Center City. As if unsettled by their future placements high on the Witherspoon Building, each section of the 9-foot-tall terra cotta figures would have jostled fitfully over the rough macadam, cobblestones, and trolley tracks of the bustling turn-of-the-century metropolis. Any apprehension, human or anthropomorphic, was soon stilled. 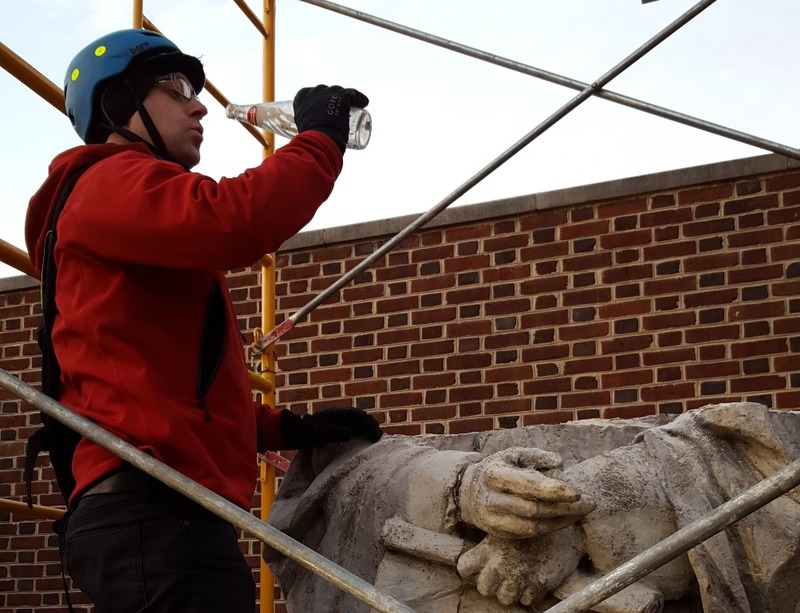 For the next six decades, the statues would stand intact atop twin gables on the PCUSA-constructed building, for a time the tallest structure in Philadelphia. In 1961, horse-powered vehicles of the motorized kind moved the figures again, once more in sections, to the new home of the Presbyterian Historical Society in Society Hill. Architect G. Edwin Brumbaugh called for the statues to be positioned in front of the under-construction faux-Colonial building, a stipulation the assemblers (at least one a fan of King Cola) dutifully obliged in 1966. Empty "King Cola" time capsule found inside Witherspoon statue, December 2015. From our front garden the in toto statues faced Lombard Street until last month, when a five-person team from Materials Conservation LLC began disassembling and transporting the figures of Francis Makemie, John Witherspoon, John McMillan, Samuel Davies, James Caldwell, and Marcus Whitman back north, this time to a conservation atelier in the city’s Kensington neighborhood. The removers used a gantry, winch, reciprocating saws, and extraordinary care; dismembering a million dollars worth of art while on-lookers film your every move requires steady hands and steely nerve. The story of that work, as well as the statues’ three-dimensional scanning by Karins and Associates and future conservation by Materials Conservation, was recently featured on the front page of the Philadelphia Inquirer. That article also delved into the mystery surrounding ten statues designed for the Witherspoon Building by Samuel Murray and Thomas Eakins, a subject first shared via blog by the Society’s Dave Koch in 2011. McMillan statue de-sectioning, December 2015. 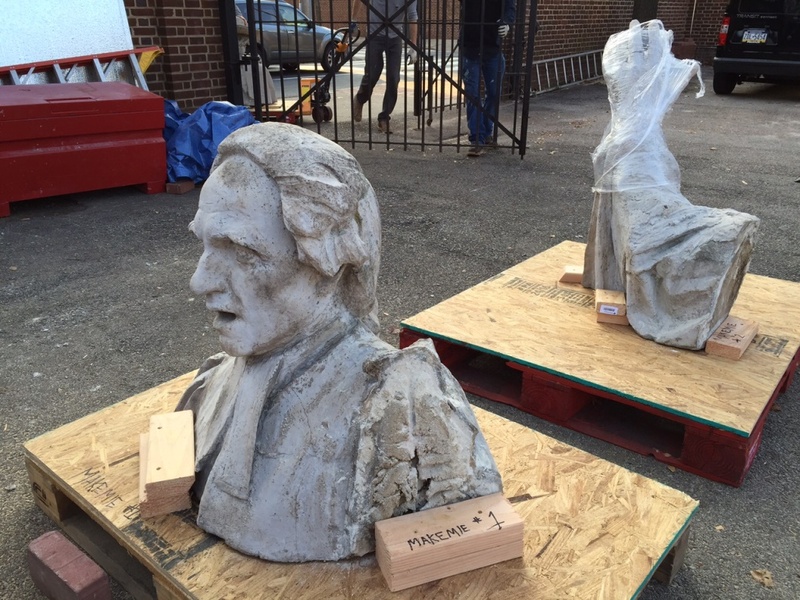 By Christmas, all the statue sections were securely placed in their temporary Kensington home, where they will be conserved over the coming months—surfaces cleaned, breaks patched or repaired, and armatures strengthened. PHS plans to reassemble the figures in front of our building in time for a summer celebration. In addition to reinstalling the statues, we’ll be renovating our front garden area. Plans are currently being prepared by Rodney Robinson Summers Landscape Architects, with Geoffrey Anderson, a member of Swarthmore Presbyterian Church, leading the work. The revitalized space will provide increased access to the statues, new plantings and lighting, and improved ramp access to the building. Together with interactive signs featuring information about the statues’ history and their distinguished creator, these steps will help the Society welcome more visitors to our block-long archives and utilize our outdoor spaces in new ways. Makemie statue sections, December 2015. The encouragement we received throughout 2015 inspired and energized everyone involved in the project. In addition to over $55,000 in individual and group donations, including a substantial matching gift from an anonymous donor, we received a generous grant award from a distinguished national foundation. We continue to raise money for the sculpture reinstallation and garden improvements. To support the project or learn more about our future plans, click here or contact Deana Stuart at 215-928-3865. We have many people to thank for the tremendous progress made so far, including longtime friends of the Society. Ronald Shaffer, a member of the International Society of Appraisers and Director of the Old Pine Conservancy, donated his time and professional expertise toward an up-to-date statues’ valuation. Renowned art conservator John Carr helped us understand just how special the terra cotta figures are to the art history of this country, and how their conservation will enable another century of outdoor display. Hugh Roberts, a guest researcher, reminded us of the ways the statues, like so many other holdings in our collections, connect with the lives of everyday Americans and their families—people no less important to the building of this nation than Calders or Caldwells, Murrays or McMillans. 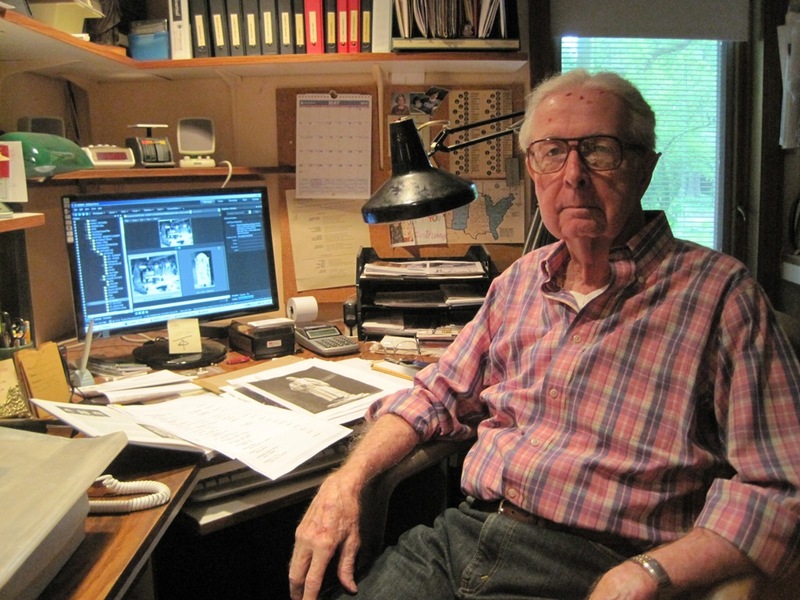 Hugh Roberts with research notes, March 2015. Hugh visited the Society years ago to investigate family lore about his grandfather working on the statues. Months later, he presented the Society with a binder filled with his detailed research notes. Assisted by his work, and by our reference colleagues at Philadelphia's Pennsylvania Academy of Fine Arts, Museum of Art, Athenaeum, Urban Archives at Temple University, and Historical Commission, we discovered documentation in our own holdings proving that Robert Rautenberg, Hugh’s grandfather, was not only involved with the fabrication of the statues, but their lead caster. Such contacts keep us excited about all facets of our work, including our preservation of the statues at Lombard Street. As a figurehead leads a ship, so the statues have faced the world from the front of our building for five decades—Makemie with his raised hand, Witherspoon his prayerful brow, Whitman a wagonwheel. We look forward to having the six figures back, and to sharing their renewed solidity with all drawn to the artistry and history they embody. 2 hours 20 min ago. Happy #EarthDay from the Presbyterian Historical Society! Here is an image of the very first Earth Day in 1970 that comes from our collection of Religious News Service photographs. To view this image and read about the Presbyterian Church and it's involvement in environmental causes over the years, visit https://buff.ly/2GznHvN.